St Augustine reminds us that it is the wretched helplessness of sinful humanity which is witnessed to in the blindness of Barimaeus. Grace calls for responsiveness on our part, Chrysostom comments, adding that God’s electing and assuring promise neother coerces our will nor denies our free response. God will save us, as he has promised, but that promise involves our being willing to respond. Clement of Alexandria tells us that the commandment of the Lord shines clearly, enlightening the eyes. If we receive Christ, we receive the power to see, we receive light by which we can recognise God. This light is more desirable than honey, richer than gold, and it is waiting for us if we will but heed his call. We should shake off our lust for the things of this world, for the things that fade, and we should seek for the eternal riches which do not fade. He was not afraid to die for us, and we should die to sin and be norn again through him. He is the true light which lights the world, and in him there is no darkness. 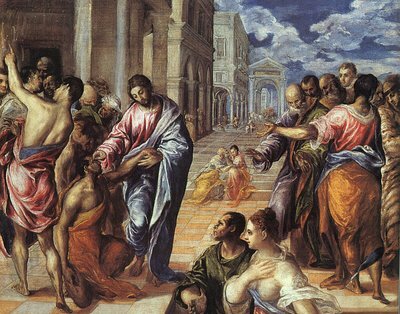 We are like the blind beggar, we see not, and we are in want – and there is one name only through whom we can be healed. Like Bartimeus, we need Christ – and through him we shall be restored to the image of God in whom we are made.